This is (was!) 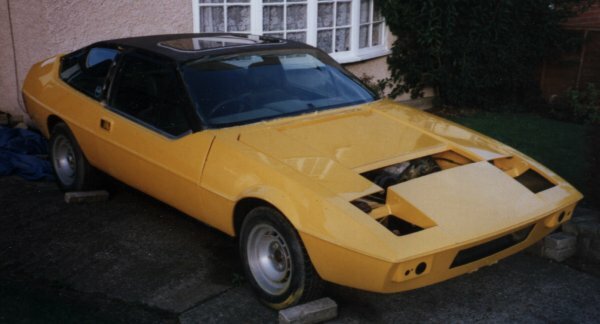 my Lotus Eclat (1976). 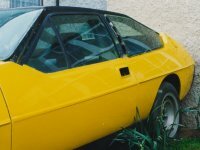 Ever since I was a boy I've wanted a Lotus of some description - preferably the Esprit similar to 007's in the Bond movies 'For Your Eyes Only' and 'The Spy Who Loved Me'. (Apparently many aspirations of Lotus-owning start this way !) However this is now my pride and joy - bought in Summer '97 in what can only be described as 'in need of work'. Most of the boot was missing. The brake master cylinder also leaked. On the bright side, it did have the rear wheels and rather a nice yellow paint job. So I went up to Northampton to buy this thing, looked at it and reckoned it would take me about 4 weeks to sort out. I hadn't seen it's service history, the owner was moving and therefore to shortly become non-contactable and it hadn't run for well over a year.